There is a variety of beautiful designs and finishes by wholesale registers. This floor register is a classic Victorian design with a refreshing satin nickel finish. Sizes 2 x 10 inches to 6 x 14 inches. Wall mounting clips for Rockwell, Victorian & Contemporary Floor Registers to create wall registers. These finely crafted brass floor vents will add beauty and function to your home. They can be used on the floor, wall, or ceiling, see inside for specific details. Sizes 2 x 10 to 6 x 14 available. Copper floor registers are a perfect accent for your home. The Victorian design is sure to be an eye catcher. Choose from sizes 2 x 10 to 6 x 14. Fun and functional registers with a flat black finish and Victorian design are perfect for your home. Select from 9 different sizes: 2x 10 to 6 x 14. These Victorian vents are not only a beautiful accent piece for your home, they are also functional, allowing you to control air flow. Select from size 2 x 10 up to 6 x 14. Look no further for modern decorative floor registers which allows you to control airflow. These polished brass 3mm plated contemporary vents are just the thing your home decor is looking for. Available now in 9 standard sizes. Compliment any space with our modern brushed nickel floor registers. Make your life a little bit easier with the drop in installation of these durable steel registers. Buy today and see the difference. Available in 2 x10 all the way to 6 x 14. Stylish copper vent covers plated in 3mm steel can be yours today by just a call or click of the mouse. There is a protective lacquer that also helps to prevent tarnishing. We have sizes from 2 x 10 to 6 x 14! Durable and affordable, these oil rubbed bronze contemporary vent covers add a richness of color to your life. 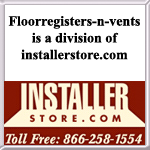 Available in 9 sizes, these floor registers come with a steel core construction and steel damper. Try it today! Our contemporary, black floor registers have a one step drop in installation. The 2" and 4" wide sizes can also be wall mounted with metal brackets which are sold separately. Order today! Decorative Rockwell floor air vents made with 3mm thick steel are great for your home or office. This polish brass register will accent all styles and will bring a sunny look to your space. There are 8 sizes available! Decorative brushed nickel floor registers, with easy drop in installation, will brighten up your space with their Rockwell design. Sizes from 2 x 12 to 8 x 10.Durable and affordable, try today! Bright and classic, these copper floor register will give redesign your space with its beautiful Rockwell design. They are made for the floor but can also be wall mounted, with the proper equipment, so your whole house can be made to match. Available in sizes 2x12 to 8x10. Warm and finely crafted, our Rockwell oil rubbed bronze registers are made out a 3mm thick steel core. Made for strength, these metal floor vents can be floor or wall mounted! Choose from our range of sizes: 2 x 12 to 8 x 10. Our black floor vents will work great in your home or office with its powder coating finish to help prevent tarnishing. Made with a steel damper that is adjustable, this product is a sturdy choice. Ranging from sizes 2 x 12 to 8 x 10.